It was the first time Vietnamese tennis fans watched two former world champions and another international star play on the course. World ex-champions Carlos Moya and Carlos Ferrero from Spain and Germany’s Rainer Schuettler, who had a career-high ranking of 5th two years ago, competed in the Heineken Stars tournament in Ho Chi Minh City Saturday. They brought three exciting games to the big crowd at Nguyen Du Indoor Stadium. Schuettler, 30, who currently ranks 78th on the ATP table, was the champion, pocketing US$40,000 after one win and one loss but won the one-day tournament thanks to a better result. Spanish star Ferrero came second also with one win and one loss, getting US$20,000, leaving the third position to Moya with US$10,000. Moya also won one game and lost one. In the first match, Schuettler won Moya 7-6 in the first set and Moya won 6-2 in the second. They entered the tiebreak and the German won 10-8. In the second game, Schuettler beat Ferrero 6-4 in the first set but lost 3-6 in the second. The Spanish former world No.1 won 10-6 in the tiebreak. Then the two Spanish stars played the third match. Ferrero advanced with 6-3 but Moya equalized 6-2. This resulted in the tiebreak, in which Moya won 10-5. The tiebreak rule was applied here because the tournament was an unofficial event in only one day. 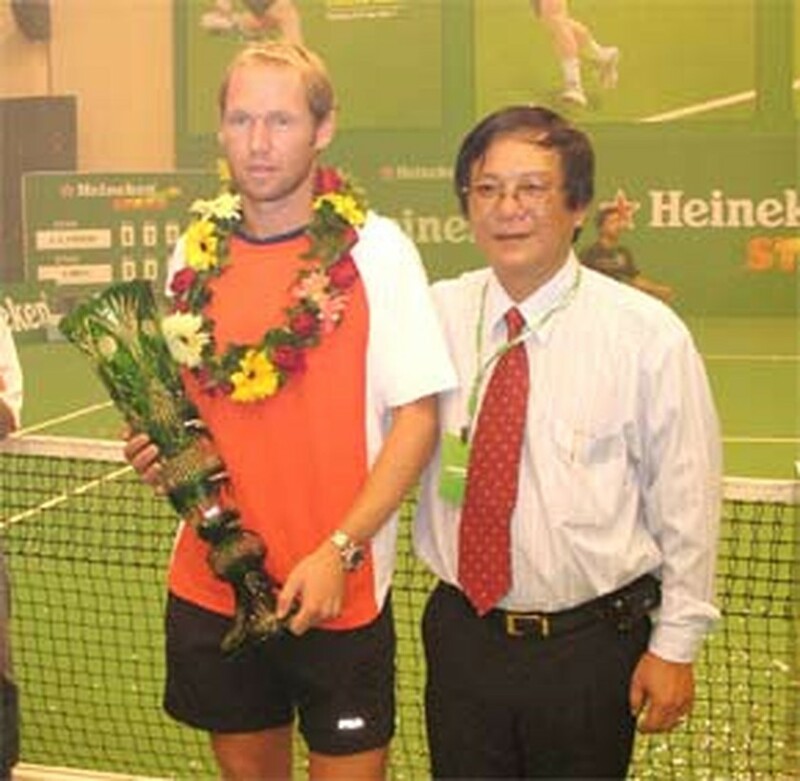 Nicolas Kiefer, who earned his highest ATP ranking – fourth – in 2000, came to Ho Chi Minh City to vie, but his luggage was lost during the flight. Therefore, Kiefer could not play at all because he has a contract with the Italian tennis equipment firm Diadorra, while its items are not available in Viet Nam. As he could not play, the organizers changed the competition into a round-robin tournament for Schuettler, Ferrero and Moya. They brought to the crowd lots of artistic performance never seen in a real competition like U.S Open or Australian Open. 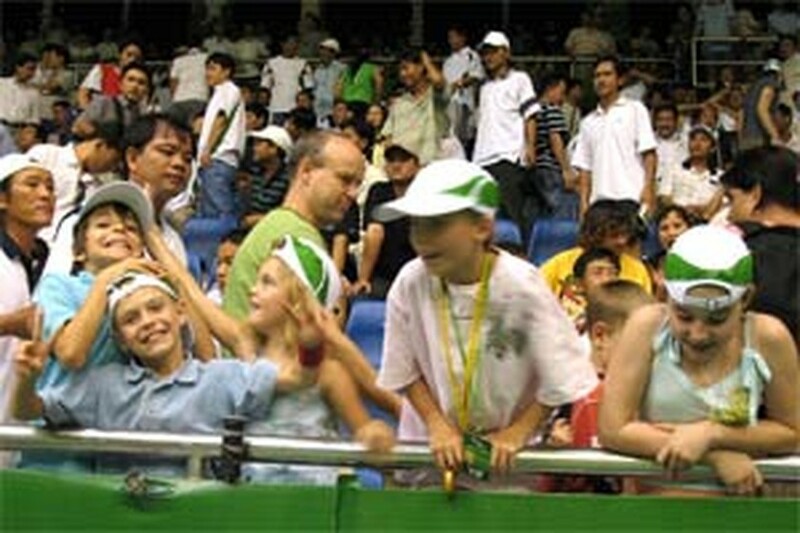 Television audience also watched them at the same time because Ho Chi Minh TV broadcast the games live. Big fans, including foreigners in Viet Nam, rushed to the stadium to receive signatures of Schuettler, Ferrero, Moya and Kiefer. Kiefer did it more as he had more leisure time.